This year I’m celebrating the holidays with a “12 Days of Christmas” series on the abundances of our kitchen and garden. Share your experiences, too, and happy holidays! and 1 quart of yogurt, homemade. This is the (at this moment) messy endeavor taking up one corner of our kitchen floor this week. Mr. Cheap took off like a house afire brewing beer just about one year ago. Since then, he calculated that he has brewed nearly a dozen batches. Most have been pale ales, the quickest-and-easiest version of home craft brewing. He’s made a couple of varieties of Belgian saison-style beer, a few stouts, an apricot beer and a biere de garde. The one cooking in this photo is an IPA, with a recipe begun from a Red Hook-style base and modified for a partial mash brewing, where the homebrewer uses less purchased syrup and more cracked grains. In June, I published a post with a cost breakdown for brewing your own beer. The poll on that blog showed that more than 80 percent of readers who responded either do brew or would like to, so I thought another post might be worthwhile. Went with a pale-ale-style recipe, both so it will be ready to drink sooner, and so the ingredients are simpler and more affordable. Used the partial mash method. Grains sell for around $1.75 per pound, and on this most recent trip, we even found local, Colorado-grown barley malt. On the other hand, malt syrup, the stewed-and-condensed result of steeping grains, is $5 per pound. It takes a bit more time in the brewing, but otherwise, Mr. Cheap reported smooth sailing. Used dry yeast. 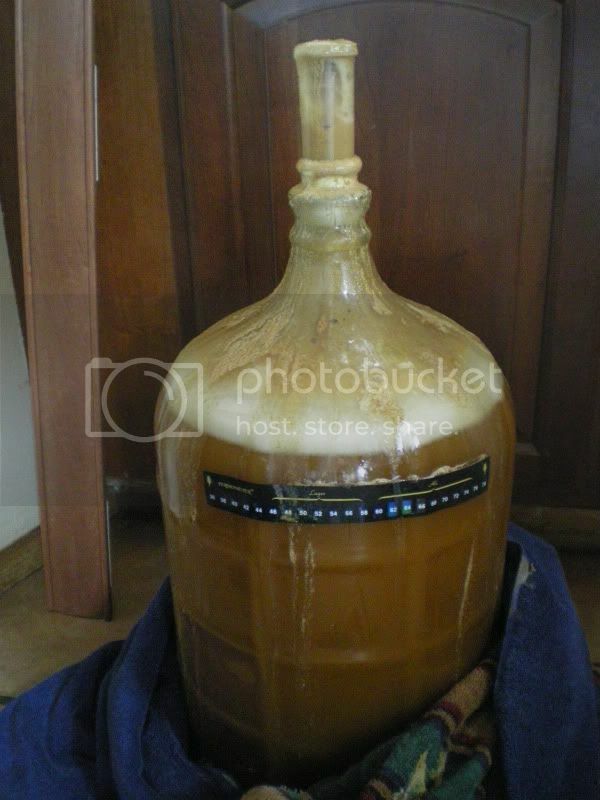 For some beers (like his Belgian ales), liquid yeast is necessary, but for this beer, he made a “mini-wort” (cooking up a small amount of grain and hops and letting it cool to yeast-friendly temperature), then added some yeast nutrient and his dry yeast and let it hydrate the yeast while he completed the rest of the brewing process. The results, as you can see in the photo, were explosively successful, and cut $3 off the price (but slashed yeast costs by 50 percent). At $38 for a batch that will turn out about 50 bottles of beer, the cost comes down to $0.76 per bottle — you can’t top that! Cheers!